Hey all and welcome! Today I’m participating in a fun blog hop, marking the launch of the new Hero Arts 2016 Summer catalog in the Hero Arts online store! 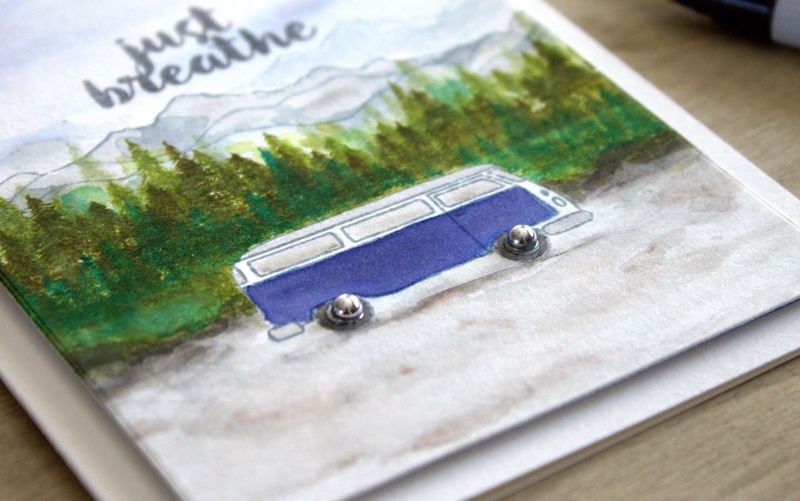 For my cards today, I used the new Road Trip stamp set, and went a little crazy with some quick and lazy watercoloring! This was so fun to make! To start with, I took a 4.25×5.5 watercolor cardstock panel (larger than I needed, but I like to start big so it’s easier to trim down later) and stamped the mountains. The nice thing about the mountain stamp in this set is that, while it doesn’t quite cover an A2 card the short way across, it’s super easy to continue the mountain “border.” I stamped the mountains using Weathered Wood – for the background mountains, I inked up with the same ink, but stamped off on some scratch paper before stamping onto the panel. This way I get a more faded look for those background mountains. Then I colored the mountains with a mix of Zig Clean Color brushes and Weathered Wood, using a water brush to mix them. There was really no specific way of coloring them, just what I thought looked nice. The trees were stamped haphazardly using a mix of Distress Inks (listed below) and water, to blend it out. The sky and ground were colored using a mix of Zig Clean Color brushes and Distress Inks as well. I topped off the campers with some gems, and stamped a sentiment from the Hello Gorgeous stamp set. If you are having problems viewing this video, please try watching it HERE on YouTube. Now, for the rest of the blog hop – be sure to visit everyone on the list and leave a comment. Hero Arts is giving away three $25 shopping sprees, drawn from comments left across all blogs in the hop. Please comment by Sunday, May 15 at 11:59pm PT and the winner will be announced on the Hero Arts blog the following week. Thanks so much for stopping by and God bless! Stamps: Hero Arts Road Trip and Hello Gorgeous! Beautiful! I would like to go there. I'm a huge fan of camping and outdoors so these stamps will be awesome. I love your coloring and the images those stamps evoke. In the 70's we used to go camping. We rented a pop-up trailer and pulled it on the back of our car. Some of the campgrounds had out houses. My youngest sister was little and swore she wouldn't use the outhouse the whole time we were there because it grossed her out. It's funny that I remember that. You did such a nice job on all your cards! Wow love this stamp so many uses for it… great cards too. Wow!!!! I love this new release!!! Great cards!!!! I love this card and your watercolor style suits me! Great cards! You make water coloring seem less intimidating. Thanks. It fascinates me to see an approach I'd never think of. well done. So much detail! Very cool cards. I love your cards! I wondered what to do with all those grey markers… Mountains! Your trees are beautiful. Great job. 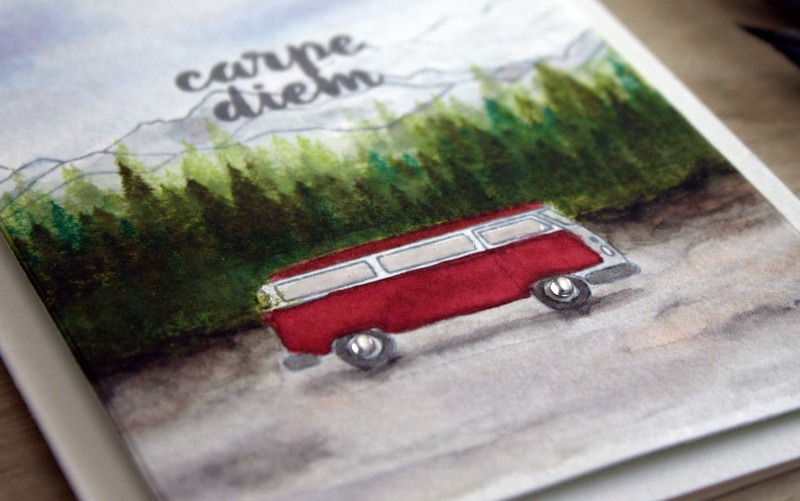 Great projects – love that camper image & your techniques have created a fabulous work of art. Thanks for sharing. Wonderful cards, love you mounts and trees there perfect. Thanks for sharing. 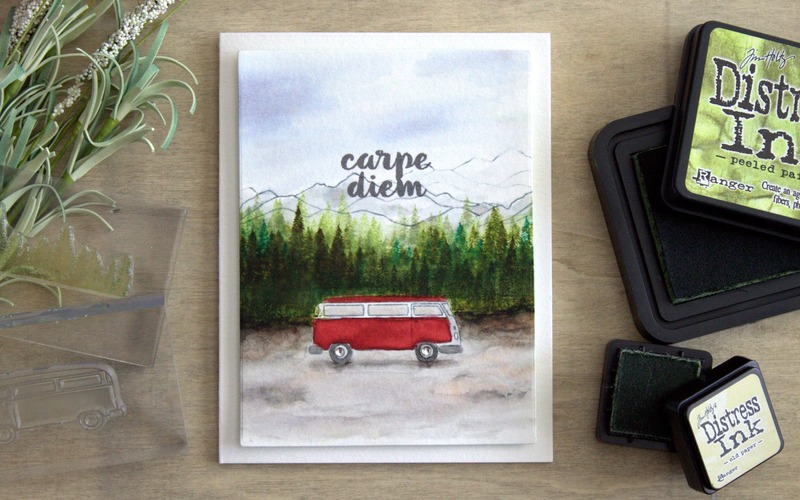 Love this card and need these stamps. These cards are so awesomely done!! Impressive watercoloring! You've got skills!! Love the mountains and trees. Amazing cards and I love the sentiments. You are so talented!! Love your cards. The mountain and trees look great. Thanks. Really fun bus with the great scene behind it! Wow, your fab forest looks like a real photo!! 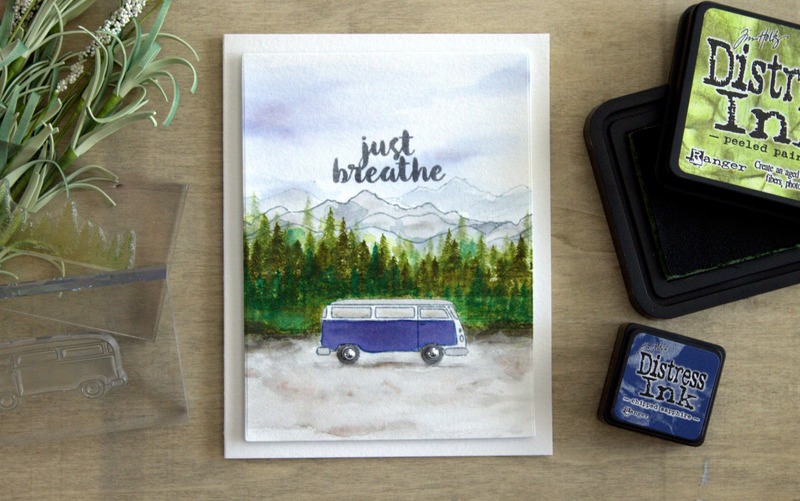 I love these cards – beautiful watercoloring! Thanks for the video, also!